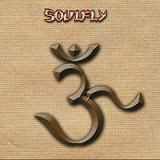 SOULFLY - 3 (CD) | Online Shop | Wizard LTD. Spin (8/02, p.110) - 6 out of 10- "There's something undeniably thrilling about an Ozzfest demagogue who champions dignity as a human right and makes a maxim like 'Faith is a weapon' his rallying cry...the band remains a hard-charging, tribal-drumming monster fierce enough to kick the bulldozers out of the rainforest....3 could be the charm for Soulfly." Alternative Press (8/02, p.67) - 7 out of 10 - "Streamlined and digestable...A impenitent tone is set from the start...enough to get the troops of doom marching once again." CMJ (6/17/02, p.16) - "This one is a winner; don't miss out." NME (6/22/02, p.52) - 6 out of 10 - "Another clench-jawed grind through seven kinds of hell...Soulfly must be the only band who can make the obligatory minute of Sept. 11th silence seem loud." All songs written and composed by Cavalera except "One Nation" which is originally written and performed by Sacred Reich, "Call to Arms" (Cavalera, Marianino) and "Sangue de Bairro" which is originally written and performed by Chico Science & Nasao Zumbi. Greg Hall - drums on "One Nation"